Thousands of people depend on the Black Warrior River for recreational opportunities as well as drinking water. People fish, flyfish, swim, boat, kayak, canoe, waterski, wakeboard and take advantage of many other recreational opportunities along the Black Warrior and its tributaries. In Alabama, outdoor recreation generates $7.5 Billion in consumer spending, 86,000 direct Alabama jobs, $2.0 Billion in wages and salaries, and $494 Million in state and local tax revenue. Throughout our great nation, outdoor recreation creates 6.1 million American jobs. $646 billion in outdoor recreation spending each year. $39.9 billion in federal tax revenue. $39.7 billion in state/local tax revenue. (Source: Outdoor Industry Association’s 2012 Report). Click here to visit Black Warrior Riverkeeper’s webpage about fishing in the Black Warrior River watershed. Boating Magazine called the Black Warrior one of America’s best kept secrets for boating. Click here to visit Black Warrior Riverkeeper’s webpage about boating in the Black Warrior River watershed. The Black Warrior’s Locust and Mulberry Forks provide excellent whitewater paddling opportunities, including the Alabama Cup Canoe and Kayak Races. Paddling is also popular in some smaller creeks, such as Five Mile Creek in Jefferson County, home of Five Mile Creek Canoe & Company. Visit the Alabama Whitewater website for more paddling information, and contact the Birmingham Canoe Club if you have any questions. In Tuscaloosa, the Black Warrior River has been the site of the Black Warrior Triathlon in recent years, along with the U.S. Olympic Team Trials and the U.S. Collegiate Nationals. The Tuscaloosa News estimated that the April 19, 2008 contest would boost the local economy by $12 million, approximately the same amount as an Alabama home football game against Tennessee! The triathlons take place near the famous docks of The Bama Belle. Many waterside areas are excellent destinations for walking, fishing, observing wildlife, and visiting historic sites, such as Moundville Archaeological Park, Bankhead National Forest, Hurricane Creek Park, Turkey Creek Nature Preserve, Talladega National Forest: Oakmulgee District and the Horton Mill Covered Bridge, the highest covered bridge above any U.S. waterway. Additionally, Alabama’s Forever Wild Program provides many recreational opportunities. Click here to learn more about Forever Wild. 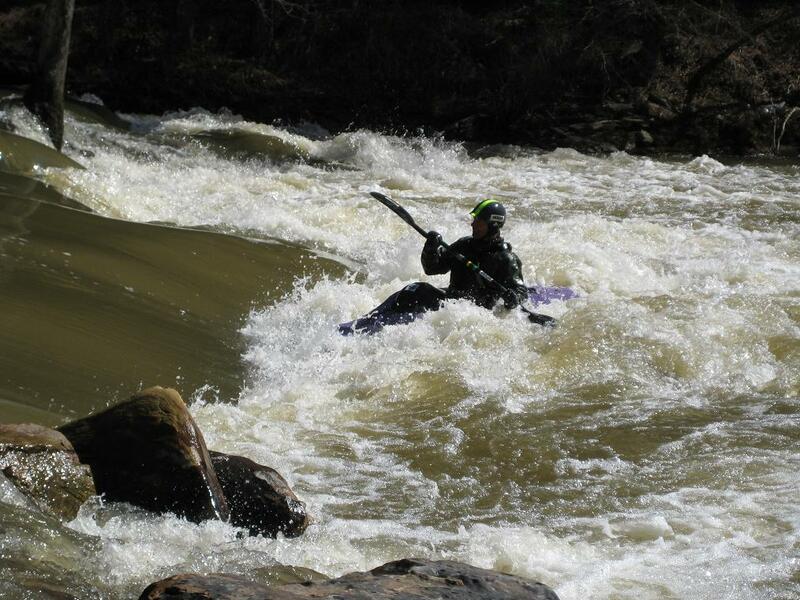 World Champion Freestyle Kayaker Eric Jackson on the Black Warrior River’s Locust Fork.